My Heritage is a genealogy site that has some fun features. You can compare your picture to celebrities and find your celebrity twin. You can also put in your babies picture, and pictures of both parents and it will tell you who the baby resembles the most. You can put an end to all the family feuding about who the baby looks like. Once you get the results you are able to post them to your blog or to Facebook. The Look-alike Meter is free to anyone who wants to use it. You have to register with My Heritage and that involves setting up a free account. Once you are registered you can upload three pictures to be analyzed. They can be uploaded in any order. The facial recognition program scans the pictures and then has you drag them into the Mother, Father and Child positions. While you wait for the upload to process there are some advertisements that you can either look over or skip them all. I was able to upload two of my children and get the results in less than ten minutes. It was surprisingly easy and fun to finally find out exactly who they look like. Everyone always says how much our oldest looks exactly like me. It was interesting to see that according to the face recognition software she only looks 4% more like me than her dad. 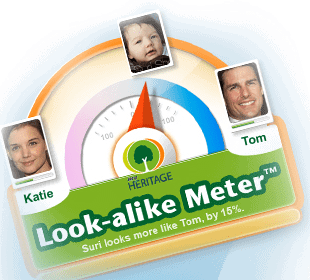 The Look-alike Meter is fun and can spark a lot of family discussion. I’ve used this site for a while and found the celebrity lookalike feature to be the most entertaining one. The main problem with it, though, is that it actually compares not people, but photos. So, it’s likely to give you some wild matches based on the similar camera angle and other minor stuff. It gave me a high match percentage for both Katherine Heigl and Trelonius Monk – two people that really have nothing in common. But there is a workaround: load several photos and watch the people who keep appearing on the list. The will probably be your real lookalikes.